A couple years ago, I FMD'ed a cinnamon roll recipe (The Pioneer Woman's recipe, which is the BEST on the planet) and I could not find a frosting for it. I pondered on it, wanting something light and tasty, not too sweet. I knew it would come to me, so I let it go. Today, as I made my Blueberry Lemon Donuts, I attempted a glaze but it did NOT work out like I wanted. I looked around my baking supplies and it hit me. Blanched Almonds. So I made the drizzle and realized as I tasted it, that it is not only versatile with flavors but with uses, and it would taste amazing on my cinnamon rolls! And my breads! And even pancakes! 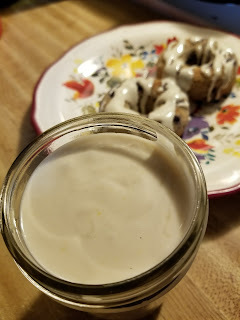 This version is lemon flavored but you could add vanilla, cocoa powder, almond extract (tastes amazing on cinnamon rolls), orange zest, lime zest... so many choices! Blend it all together in a high speed blender, until super smooth. Whole recipe is 2 servings of healthy fat. Sounds yummy!! Question - do you purchase almonds that have been blanched or is blanching them a process you do yourself? Have you froze the drizzle before? Do you think it would work with almond flour? Or is the flour too dry? I've not tried that, so I'm not sure. Do you use canned or carton coconut milk? Thanks!